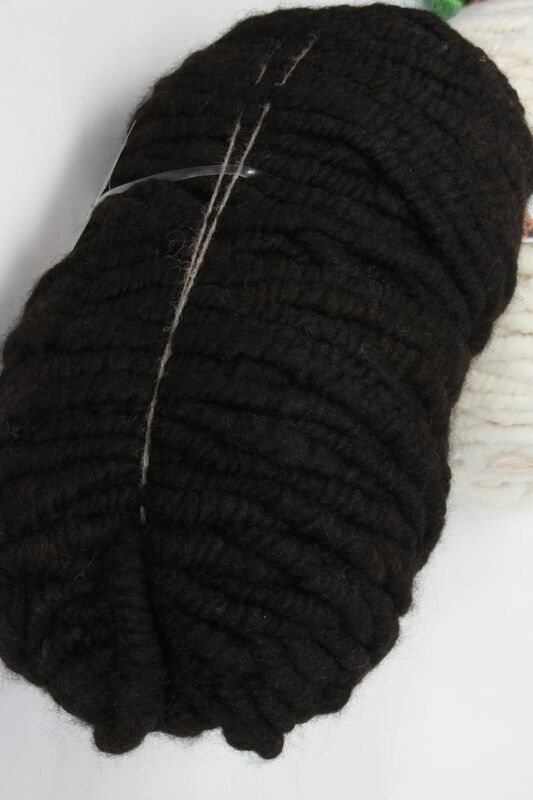 As black as an alpaca can get - undyed - which is really the darkest, blackest of blacks with a brown halo. Each bump is unique. It takes an entire animals shearing to make one bump, so these are really unique. Sometimes the mill makes more than one bump, blending different animals fiber, so we can get 2 - 3 that match pretty well. If you need matched bumps, please let us know in the comments when you check out so that we can do a visual check and try and get you the perfect combination! You may also SPECIAL ORDER ALPACA BUMPS. From the Cable Rib Shawl to the Alpaca Pillow, lots of fun projects to work your fabulous bumps into! The Bobbled Cowl is a stunner (1 bump) and the Cush Pillow will keep you comfy whilst knitting! Lots of fun projects in this book created especially for the bump! Love Bulky? Try the new CARACOL! Created originally by the Bagsmith, yarn bumps are basically giant rolls of oversized yarn, usually with a core, and intended mostly for home decor, rugs, throws. But the world did not stop there, and people have been creating things with bumps since they became the hot thing - especially for arm knitting!